When my children were living at home, I had a hotch-potch of mugs, and, sooner or later, they broke, as mugs do. Looking at my current row of mugs, I see, with some alarm, that I may have turned into a mug fanatic. Nowadays, my mugs have to fulfil certain criteria: first, they must be interesting (i.e. historical). Second, they must be equally patterned on both sides. I’m left-handed and I’m fed up with picking up a mug with my left hand and realizing that the actual picture is on the other side. No more right-handed mugs, then. So, what mugs have I now got? 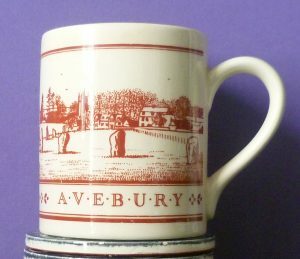 My Avebury mug has a wraparound design from an old print of the Wiltshire village of Avebury which sits in the middle of the largest Bronze Age stone circle in Europe (1800 B.C.). The stone circle is surrounded by a huge bank and ditch. I love the fact that you can walk wherever you want; clamber up the ditch, touch the stones – which you can’t do at the nearby Stonehenge. Leaping forward about a thousand years, my next mug celebrates the 8th century A.D. Pictish Shandwick Standing Stone. The mug is clumsily designed but at least it gives you some information, even if you have to turn the mug round to read it. 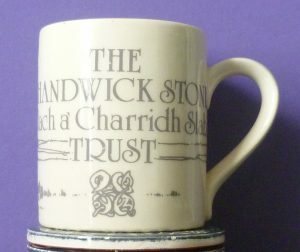 On the front it says: The Shandwick Stone (Clach à Charridh Slab) Trust. Standing on the original site overlooking the Moray Firth, the impressive 8th century Standing Stone is decorated with Christian and pagan symbols. According to a local legend, it marks the grave of one of 3 Norse princes sent to rescue their sister being ill-treated by her husband the Earl of Ross. I’d love to know the full story. The mug was my mother’s, she was keen on things Pictish (she lived in the Highlands). Quite often, when we passed the Pictish stone, she’d stop the car and we’d get out and pay our respects. Often, we’d find a small posy offering of harebells or heartsease from other visitors. 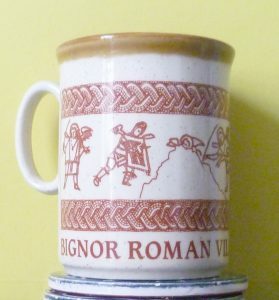 The mug from Bignor Roman Villa has a mosaic pattern from a late 4th century villa in Sussex. It shows gladiators fighting – but they are not real gladiators, they are cupids with tiny wings on their shoulders, dressed up as gladiators. It’s an odd combination – like having cherub footballers. 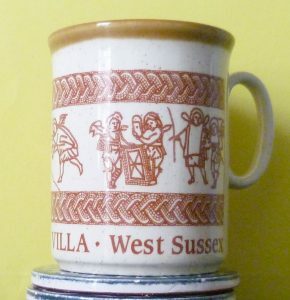 The mug fulfilled my criteria – the pattern goes right round the mug, it’s unusual and it’s definitely historic! It also reminds me of an enjoyable British Museum Friends’ day trip to Roman Sussex – we also visited Fishbourne Palace and Porchester Castle. 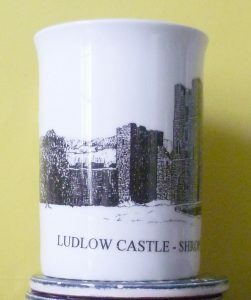 The Ludlow Castle mug is fine bone china which made it very nice to drink from. It’s too has a wraparound picture – more or less; though you get a better picture if you’re right-handed. The legend reads Ludlow Castle 1086. 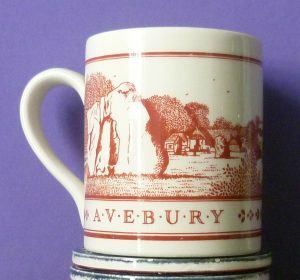 The mug might have been made for the 900th year centenary. Unfortunately, it cracked, so I now keep small kitchen utensils in it. 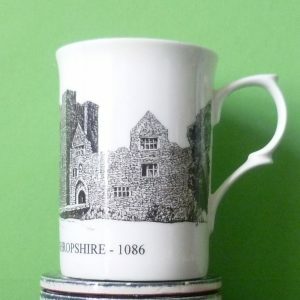 Recently, I re-visited Ludlow and popped into the castle shop to see if I could replace my mug. 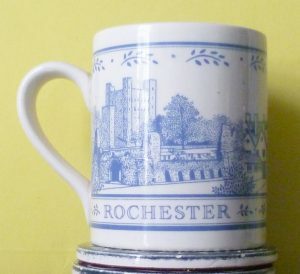 Alas, they now have thick pottery mugs with a crude coloured transfer of the castle on – you’ve guessed it – the right side. So I didn’t bother. Rochester has a lot of history to celebrate. The original cathedral was founded by St Augustine in 604 A.D., partially destroyed by the Danes and rebuilt in Norman times. It also has a Dickens connection – he’d asked to be buried there but, instead, he lies in Westminster Abbey. Dickens lived nearby and the city is full of shops called things like Tiny Tim’s Tea Rooms. My mug is another wraparound one. 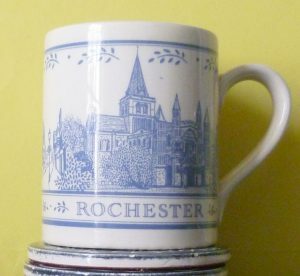 The mug shows the cathedral, a house with Dickensian associations, and the castle keep which has spectacular views from the top. Rochester also has the best and largest second hand book shop I’ve ever been in: the Baggins Book Bazaar in the High Street. An enthusiastic fan’s review reads: Any bookworm could spend hours in that bookstore and never get bored. I felt like Ariadne entering the labyrinth and wished I’d brought a ball of string with me in case I got lost. 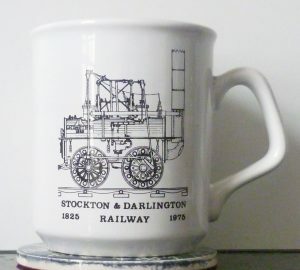 My Locomotion mug reads: Stockton and Darlington Railway 1825-1975 and comes from the 150 years’ celebration of the railway’s opening. There is a black and white engraving of George Stephenson’s Locomotion on the front and a coloured picture of Darlington’s coat of arms on the reverse. I was born in Darlington and my family rose with the railways. My great-grandfather was at the opening of the Stockton and Darlington Railway in September 1825 and left a lively account of it. He was expecting an ‘iron horse’ with legs and was bitterly disappointed to see that it was only another steam engine. 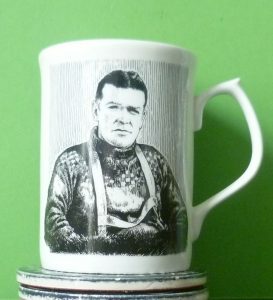 My last mug is of my hero, the Antarctic explorer, Ernest Shackleton. I bought it at the Greenwich National Maritime Museum’s exhibition on Scott and Shackleton in the Antarctic. The mug reads: Sir Ernest Shackleton (1874-1922) and adds Endurance 1915. 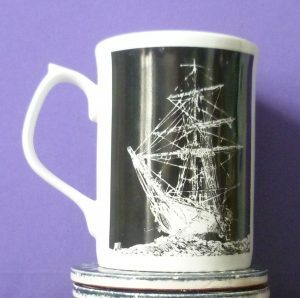 There is a black and white photograph of Shackleton on the front, and, picking the mug up with your left hand, you see a photograph of Shackleton’s ill-fated ship the Endurance which was crushed by Antarctic ice. The exhibition had the original film of the moment the Endurance disintegrated. How Shackleton got his men off the ice, sailed the three lifeboats 800 miles to South Georgia in mountainous seas, and, eventually, got them safely home is an absolutely gripping story. He was a real hero. Whenever I have friends over and offer them tea or coffee, I always ask them to choose a mug. 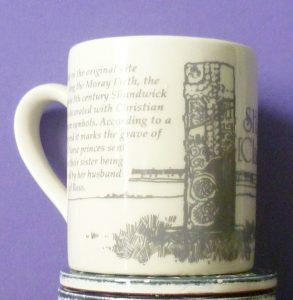 One friend picked up the Shackleton mug and said, ‘I’ll have Bob the Builder’. I can see what she means. Each mug has its own story and I’ve noticed that friends take their time and make their choice carefully. Writing this post has made me realize that what I really like about my mugs (apart from having something to look at when I pick them up) are the stories they have to tell. Thank you for your comment, Elizabeth. Of course, in the great scheme of things, left-handed mugs come pretty low down the list! But when you add having to wrestle with right-handed scissors, potato peelers and the difficulties of learning to knit, not to mention the horrors of hockey at school, you can see how irritated one can get. Fortunately, I now have left-handed scissors and potato peeler. And I’m delighted never to have to play hockey again.